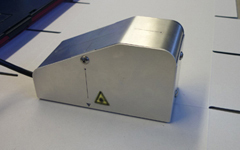 This product is a tool aiming at taking in ups and downs of the crease by applying laser light to a crease with a built-in camera as winding of laser light, and visualizing crease shape. As an addition function, it is also possible to measure the width and height a crease. While capturing the image from the Crease Shape Camera KYC-1 via USB and displaying a picture, the amount of crease bias, width, and height are measured from calculation by image processing. Moreover, by setting up common difference, it is also possible to perform the yes-no decision of measured value. Since measurement data is saved by CSV, the diversion to spreadsheet software, such as Excel, is also easy for it. Moreover, the blue LED for the manual measurement which measures width by viewing besides automatic measurement is built in, it is also possible to perform width measurement, checking an actual picture, if the switch of a case is turned ON.